Last year, Dubai announced that they wanted to modernize their police force. They weren’t talking about new body armor, innovative handcuffs, or body cams, though, but a robot police force, which they hoped to have on the streets by 2020. Dubai beat their schedule, though, and the first robocop is on duty at the three-day Gulf Information Security Expo and Conference (GISEC). It is expected to be patrolling the streets by Wednesday, according to CNN. 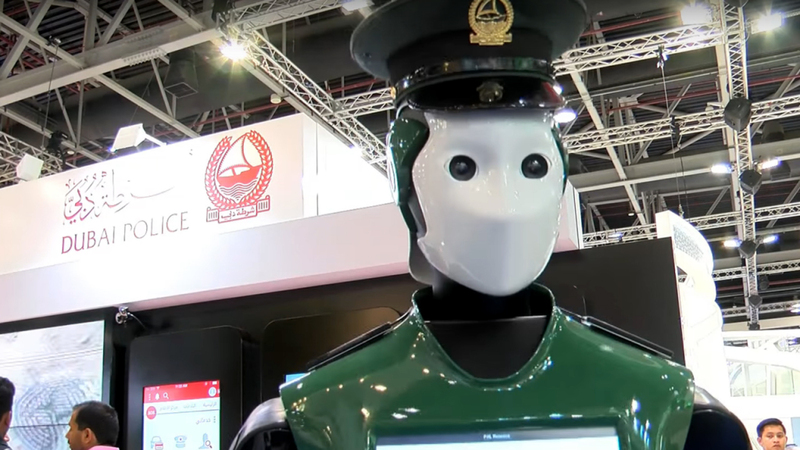 The Dubai Police Robot looks a lot more like a human than Silicon Valley’s egg-shaped version (and hopefully it would fare better in a fight, too). In its current iteration, people can report crimes to the robot via a touchscreen on its chest, pay traffic fines, and submit paperwork, The Telegraph reports. The cop can also tip off its human coworkers to start investigations. As soon as they update its operating system, make sure its facial recognition technology is higher than its current 80% accuracy, and are confident it won’t pull a Skynet, Dubai Police hope the metallic cop can start doing the hard work of chasing down suspects in the Dubai heat and making arrests. Dubai isn’t stopping there, though. To continue their reputation for being the model of a modern city, they hope to make a quarter of their police force require battery charging and system updates by 2030, according to CNN. “We are looking to make everything smart in Dubai Police,” Brigadier Khlaid Nasser Al Razouqi told Gulf News in March. “By 2030, we will have the first smart police station which won’t require human employees.” It makes sense, because robot cops will have an easier time keeping an eye on those flying taxis.